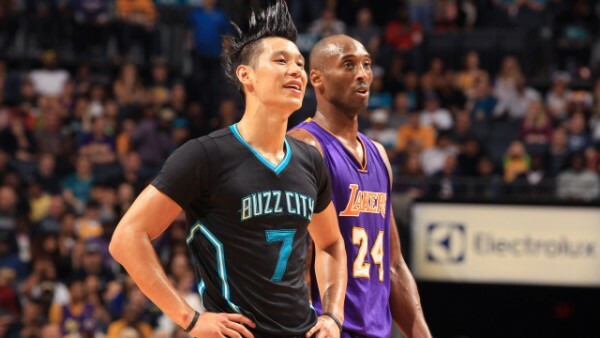 The Kobe Bryant circus, aka the Los Angeles Lakers, came to lose against the Charlotte Hornets, who had Kemba Walker playing some of his finest basketball this season, while Jeremy Lin had a nice, quiet game that neither here nor there. Walker scored 38 points in the 108-98 win, 18 of them coming in the fourth quarter. He was 14-of-25 from the field including three 3-pointers and 5 assists as well, as Steve Clifford decided he won’t be giving him any rest like he usually does in the start of the fourth quarter, decided that the rather spread schedule at this time of year allows him a little bit more of the Walker and Nicolas Batum (15 points, 11 assists) tandem, which worked out quite well. This wasn’t any different from other Hornets games in which Walker goes off or has an awful night. He simply played against the most woeful defense in the NBA, which meant a lot of open shots for everyone, as the Hornets finished with 48.3% from the field. The Lakers, losers now of fourth straight, shot 41.2% from the field in another embarrassing shooting display from the star which everyone forgives because it’s his last season. Bryant shot just 5-of-20 from the field to lead the Hornets with 20 points. Jordan Clarkson and Lou Williams seems to be competing for who can have the most Kobe-like performance with awful shooting of their own, but they also had to deal with a team that actually tries to play defense. Lin once again showed his excellent timing when swatting shots, finishing with a couple of blocks, while he also added a steal. Walker had three steals and two blocks. Lin finished with 13 points on 5-of-10 from the field in an inconsistent game for him offensively, that included one of his more acrobatic baskets to set up a three-point play, adding 6 rebounds and 4 assists. He’s been hovering more and more near the rim this season and especially in the last two weeks. It also comes from his defense, doing a much better job of staying with someone or even switching to help on a bigger player. Range isn’t just about your 3-point shooting or ability on offense; there’s also defensive range, which Lin has certainly added this season. Lin played 35 minutes, which is nothing to complain about for us. On a night in which Walker made everything light up whenever he touched the ball, it’s hard to complain about Lin not getting enough touches, although as we said, Walker isn’t going to keep shooting like this with his basketball style not changing. Al Jefferson keeps making an extremely slow comeback, scoring just 3 points in 15 minutes. All in all? The Hornets did what they had to – beating the second worst team in the NBA, and maybe building a winning streak of their own, now at a humble two.